We here at LAist think it&apos;s fair to say that if you have never visited CBS&apos; Television City complex to see a filming of The Price Is Right, you are not a Real Angeleno. Because the Los Angeles Times reports that CBS is "pondering" whether or not to sell the Fairfax studio, your window to become a Real Angeleno could be closing sometime soon. Originally built by CBS 1950 for $7 million, some estimate the Grove-adjacent property could fetch the studio up to $900 million. 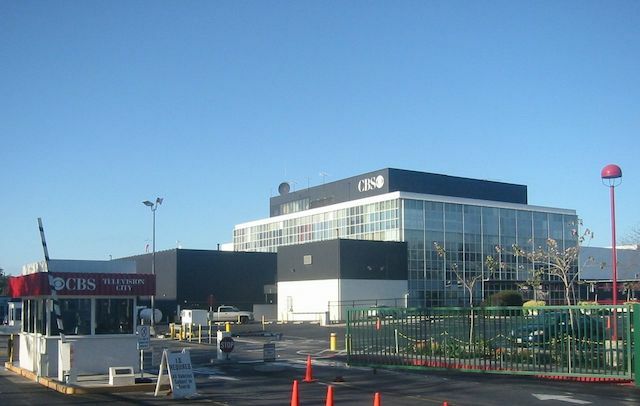 Given the fact that CBS has shifted most of its television production to its lot in Studio City, and leases many of the sound stages at Television City to other producers, selling the complex makes at least some business sense, particularly if the facility could fetch a several hundred million dollar sale price. Officially CBS has been mum about its future plans for the studio. But, as The Real Deal reports, the studio has had conversations with at least two brokerages to potentially market the property. As gossip about the property&apos;s potential sale spread, at least two major developers have also reportedly reached out to CBS for discussion. When reached by KABC, Grove developer Rick Caruso only said through a spokesperson how "We look forward to working with the community and the city as this moves forward." Whether or not Rick Caruso will purchase the studio and turn the land into a sort-of live-work-shop-play entertainment industry simulacrum (one can dream) remains to be seen. But, the property&apos;s apparent impending sale does, in a way, represent the exit of a bygone era of American (Angeleno) television. While studio today is used to film network soap operas, "The Price Is Right," ABC&apos;s "Dancing With The Stars," HBO&apos;s "Real Time With Bill Maher," and, soon, a reboot of "American Idol," the facility was once home to shows like that of Carol Burnett. "All In The Family" was filmed at the facility, as were "Good Times," "Maude," and "The Sonny and Cher Comedy Hour." In the decades prior, the facility was home to "The Jack Benny Program," "The Judy Garland Show," and was responsible for launching Ronald Reagan to major fame with his "General Electric Theater"
Bob Barker, longtime host of The Price Is Right, said (presumably in jest) to KABC that he thought it should be turned into a sort-of Bob Barker museum. "Keep it just like it is, pictures of me all around and nice things that have been written about me, kind of like a Bob Barker museum in the middle of whatever else they put there. Now that&apos;s a good idea," he said.